Lending Club vs. Prosper: Which Offers the Best Personal Loans? LendingClub vs. Prosper: Which Lender is Best for You? From debt consolidation to innovation funding, borrowers look toward these resources to help make sense financially. With thousands of would-be lenders to choose from, how can you tell which one is the best fit for your needs? 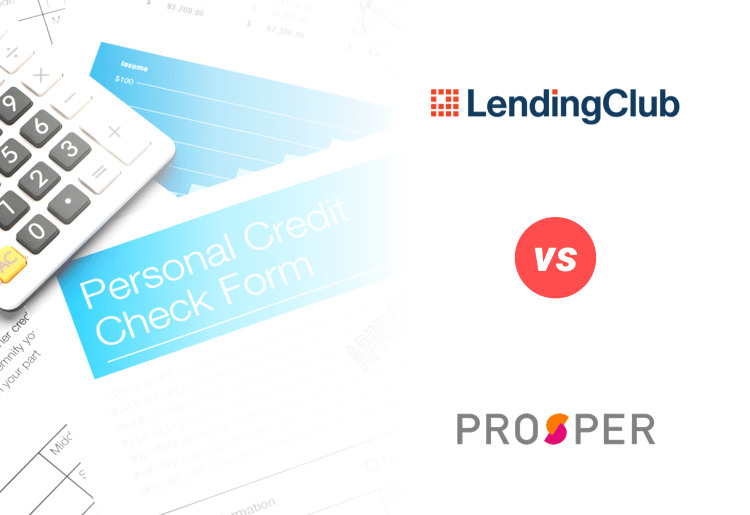 Compare LendingClub and Prosper, 2 reputable lenders, to see which one comes out ahead in this head-to-head comparison. As you can see, both LendingClub and Prosper offer flexible terms and a nice range of loan amounts. There are also similar fee structures, and both companies work with fair credit holders, a real plus if you are down on your finances. So, what are the differences between these 2 services, or are LendingClub and Prosper 2 sides of the same coin? Sometimes, it’s just a difference of the interest rate that a company offers that really makes it stand out above the competition, but in this case, there are more subtle differences as well. LendingClub is a well-known lending portal that offers people with poor credit the chance to get a personal loan with decent interest rates. It caters to a wide range of borrowers, offering anywhere from $1,000 to $40,000, and has lenient lending requirements as well. LendingClub has a good name in the industry and offers a wide variety of services. Prosper is another good choice for borrowers. With a great reputation for fast and efficient loan processing, Prosper really does a service to the lending community. This company also has great customer service and some top name recommendations from Nerdwallet, the Washington Post, and ConsumerReports. At a glance, there doesn’t appear to be much of a difference between the 2 companies, but upon closer inspection, there’s a clear winner. If you need a small amount just to get you through the month, cover an unexpected expense, or buy an item that is just out of your budget, you don’t need a major loan. The higher the loan amount, the longer and more you’ll have to pay in the end, so starting its offerings at $1,000 puts LendingClub ahead already. Plus, on the other end of the spectrum, you can get up to $40,000, $5,000 more than with Prosper, so anyone looking for a larger loan will do better with this partner as well. This flexibility puts LendingClub ahead because it means that you have more options when applying for a loan. Once again, you’ll see almost the same fees charged for both companies, including origination, late payment, and check processing fees. Prosper outdoes LendingClub in this area though, charging a lower per check fee ($5 as opposed to $7) and also capping origination fees at 5%, apposed to 6% for LendingClub. While it doesn’t sound like a lot, when you’re borrowing thousands of dollars, 1% can reflect a significant amount. It's important to take this into consideration when taking out a loan because fees can add up if you're not careful. This means that overall, Prosper comes out on top as these fees can add up over time and therefore going with this lender can actually save you a lot of money. Both LendingClub and Prosper offer terms from 36 - 60 months, meaning they are both flexible and can cover the needs of most borrowers. While there isn't any difference in the specific loan terms they offer, Prosper is solely focused on personal loans, but LendingClub offers a variety of financial solutions in addition to its personal loans, including auto refinancing, small business loans, and patient financing. Also, Prosper has a few more requirements than LendingClub does. If you are an American citizen and not a resident of Iowa or West Virginia, you can apply for a LendingClub loan. With Prosper, you’ll also need to ensure that you have fewer than 7 credit bureau inquiries within the past half a year and that you haven’t filed for bankruptcy within the previous 12 months. Plus, Prosper loans are not available in Iowa, Maine, North Dakota, and Pennsylvania. Prosper is known to work with credit holders of a higher score than LendingClub. Prosper’s lowest credit score is 640. LendingClub, on the other hand, has a reputation for working with even really low credit scores (as low as 600). This makes LendingClub an obvious choice for anyone who has less than favorable credit or not a lot of credit history to show for themselves. Plus, LendingClub will allow you to use a co-signer if your credit is really bad, making it possible to get a loan even with the lowest scores around. This makes LendingClub a much more viable option because it's accessible to a much wider variety of potential borrowers, which makes it more flexible. Both LendingClub and Prosper have fast online application forms. This is great for borrowers because it means you can reach out to multiple borrowers quickly and with a single application form. It also means you can do easy comparison shopping straight from your computer. However, Prosper loans usually clear and are in your account faster than LendingClub loans. On average, you can expect a loan from LendingClub within 7 days, while the same loan from Prosper can be there within 3. This can make a huge difference if you need access to funds quickly and can save you a lot of time. Prosper started out in 2005 and LendingClub came onto the scene just a year later, so they've both been in business for a little over ten years. Prosper holds accolades from the Washington Post, ConsumerReports, and NPR, while LendingClub touts acclaim from CNN, The New York Times, The Economist, and Inc.com. If you hold online reviews as a good judge of character, LendingClub has a better reputation. While there are fewer reviews to compare with Prosper, LendingClub’s reviewers were predominately pleased with the service, offering an 85% success rate, as opposed to Prosper’s 65% satisfaction rate. Both LendingClub and Prosper have email and phone support, as well as an in-depth help center with loads of FAQs to choose from. Both services provide comprehensive search functionality with which you can navigate the help center and get an answer to any question you might have. But, Prosper easily wins this competition for one simple reason: it clearly puts its contact information on every page, so if you have an issue, you can just click on the link and be directed to the customer service method of choice. LendingClub, conversely, makes you jump through hoops to find its contact form and phone number, forcing you to rely on the help center first and foremost. In conclusion, you can see that both Prosper and LendingClub have a lot to offer the typical borrower. They both offer similar competitive APRs and repayment terms, which puts them ahead of the pack in the personal loans industry as a whole. Prosper is a great choice if you have better credit and can therefore take advantage of more attractive rates. Prosper also offers solid customer service and will get your funds to you faster than LendingClub. LendingClub pulls ahead, however, with a larger loan range, more flexible loan terms, better reputation, and a slightly lower APR. Plus, LendingClub works with people who have really low credit, a major benefit for many borrowers who haven’t had success with other lenders. To learn more about either of these loan marketplaces or other lenders, read our in-depth reviews.